I left the house at 3:30 PM on Tuesday and was parked in the Brewers 1 parking lot 64 minutes later. After about 45 minutes I started to get nervous, but I was able to sell my two seats for $80. I had front row Amy’s ticket for the game, and a friend had backed out on using my two tickets, so I had to scalp them. There are always 10-15 scalpers in front of the stadium and I was sure one of them was going to swoop in and steal the sale from me. A grown-up brother and sister bought the two tickets from me and I thanked them for their donation and gave them one of my cards. I also stopped by the seats about an hour later and thanked them again. After selling my tickets I walked around for about an hour and handed out my cards and talked about Be The Match. 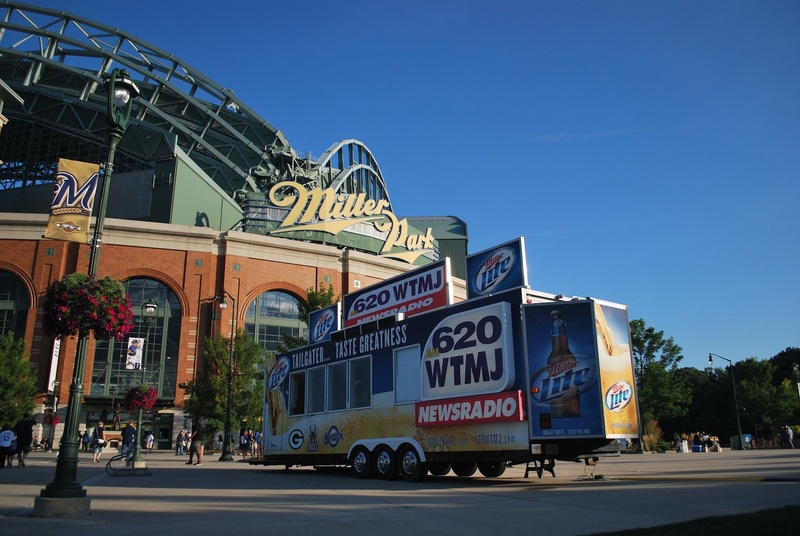 On my way inside at 6:15 I stopped and got a picture of the 620 WTMJ tailgater that I had done my interview in the day before. I meant to get a picture of it on Monday but I forgot. 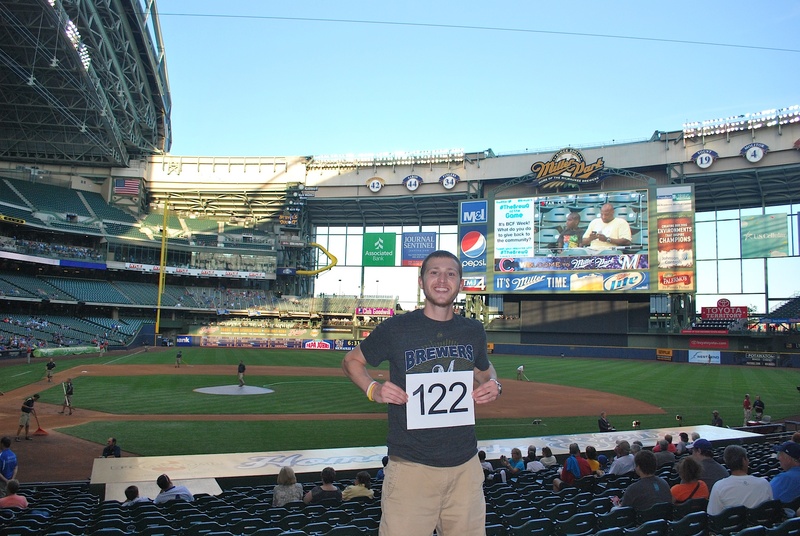 I went to section 114 for game photo number 122. A nearby fan, Derrick, did the honors and it only took him two tries. His first attempt was very good, so I didn’t feel bad asking him to pan up just a little. Thanks Derrick! Even though I was sitting in section 117 for the game I went up to the loge level to get a Polish sausage. I wanted to say hi to the Ice Man and Bill, and assure the latter that I was at the game. I didn’t stop by on Sunday and on Monday he asked if I was there the day before. After eating I went back down to the field level and got ready for the game. As the national anthem was sung I could hear their voices before the sound came through the speakers, that’s how close I was. Thanks again Amy! 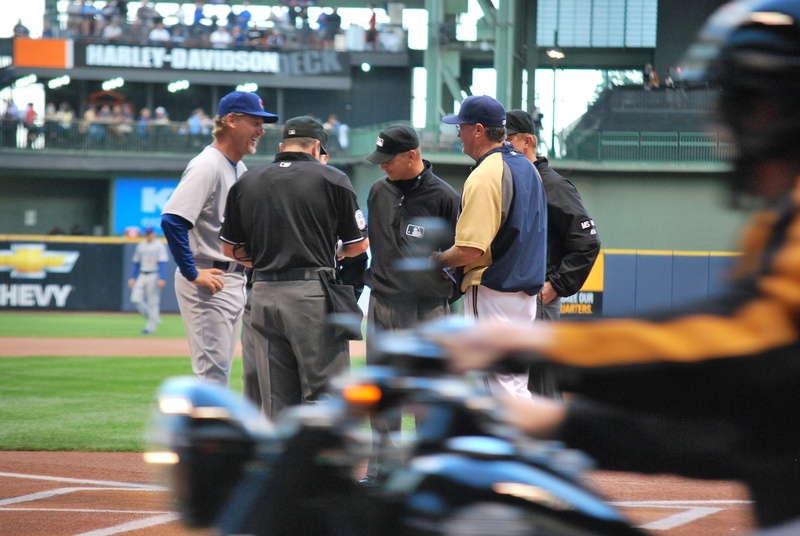 Soon thereafter the bench coaches came out to exchange the lineup cards. I didn’t plan on getting the Harley Davidson in the shot but that’s what went down. Someone riding a Harley Davidson delivers the game ball from one of the outfield corners, and it’s (at the very least) used by the starter as a warm up ball. Marco Estrada threw a called strike to David DeJesus to get the game underway. 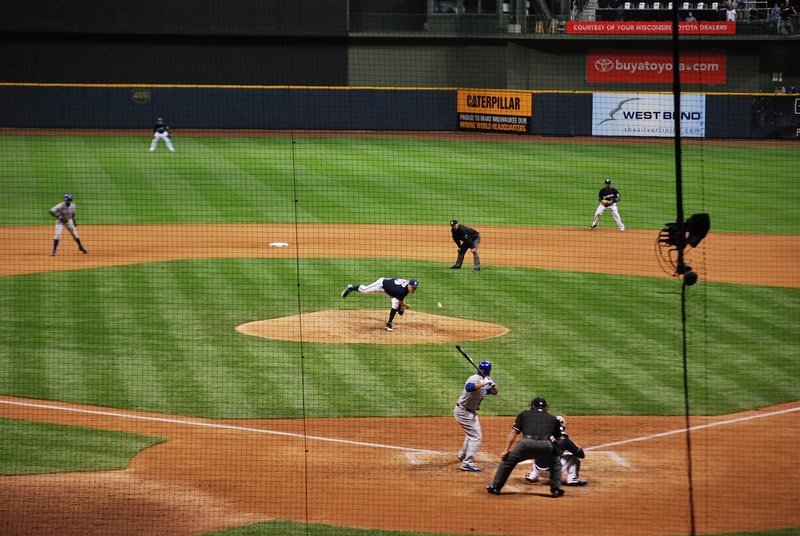 The ball is between the shortstop and the batter in the picture below. I knew that I would be on TV throughout the game and I took advantage of the opportunity. I have to thank my wonderful girlfriend (of 2 years on Tuesday) for taking the picture and sending it to me. Thanks Victoria! 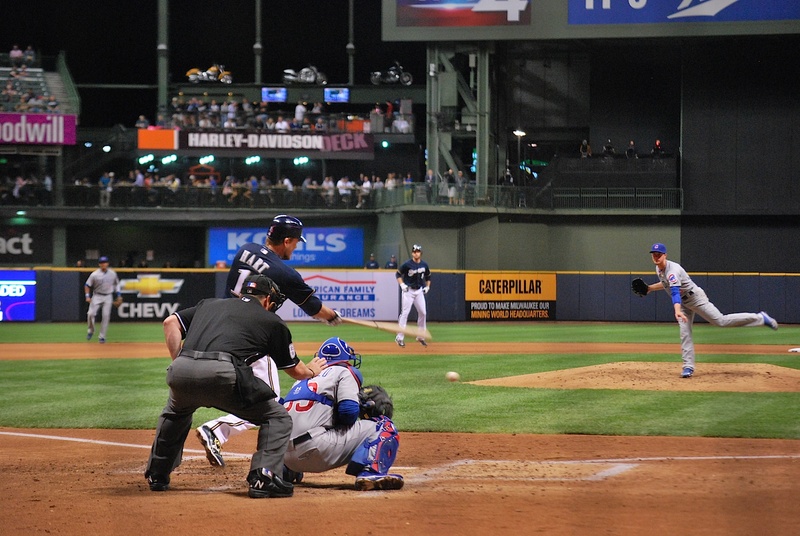 The Cubs starter, Chris Rusin, was making his major league debut and he retired the first nine batters he faced. 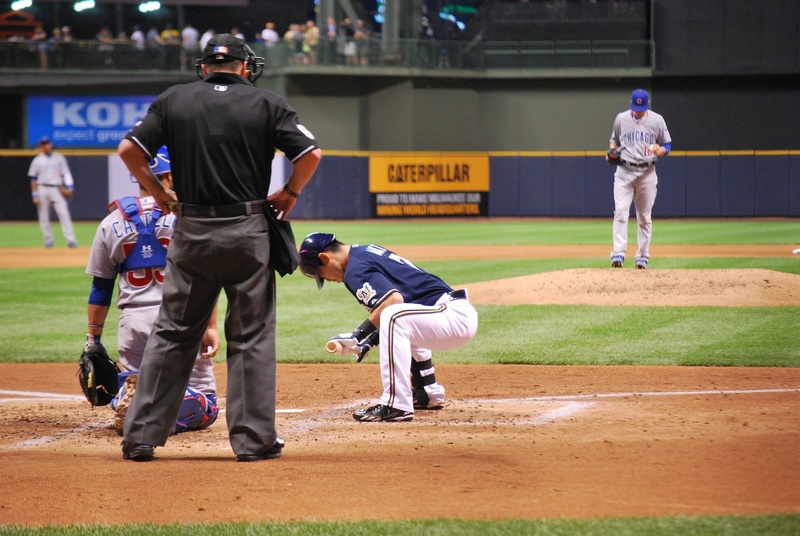 Norichika Aoki came to the plate in the bottom of the 4th and did his sumo-style stretch as he stepped in the box. Aoki was hit by the 1-1 pitch and let out an “AYE!! !” that made me and most everyone around me chuckle. It was OK to laugh because Aoki was fine. I would not have been laughing if there was a chance that he was seriously injured. 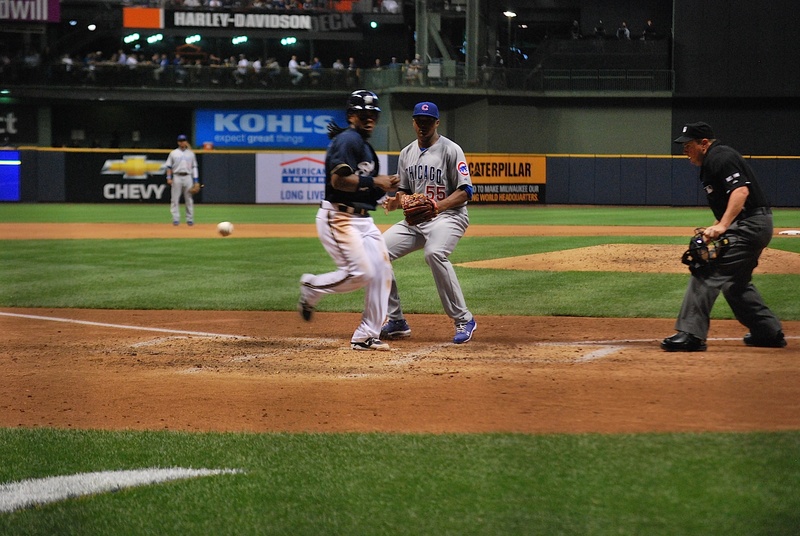 Weeks struck out, Braun was walked, and Aramis Ramirez was also hit by a pitch. Corey Hart had a chance to break the scoreless tie and he didn’t disappoint. 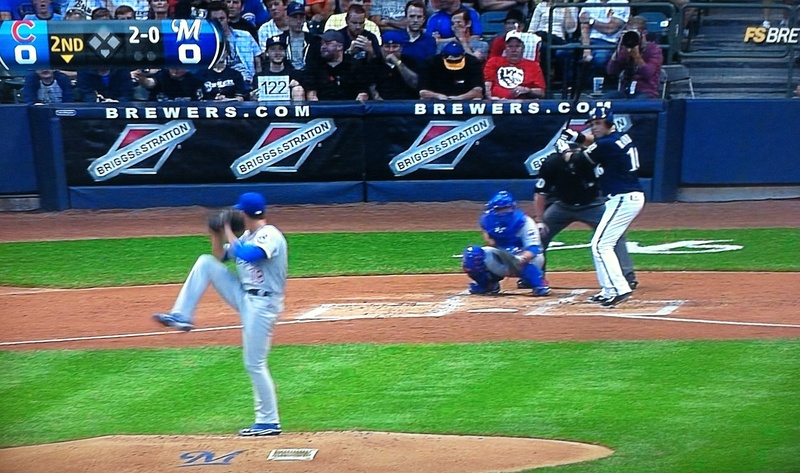 Hart lined one off of Rusin (he too was fine) for an infield single and the Brewers had a 1-0 lead. 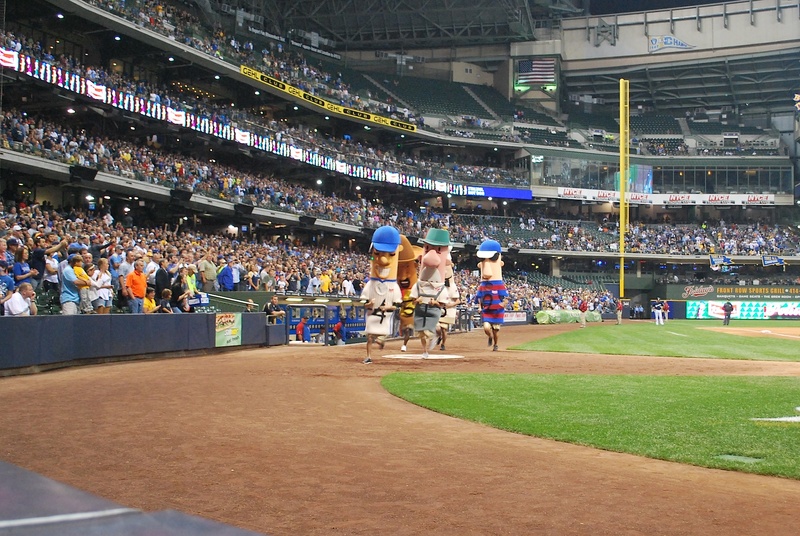 In the middle of the 6th I got to see the sausage race from a different perspective; Sausage stampede!!! In the bottom of the 6th three walks loaded the bases with only one out. 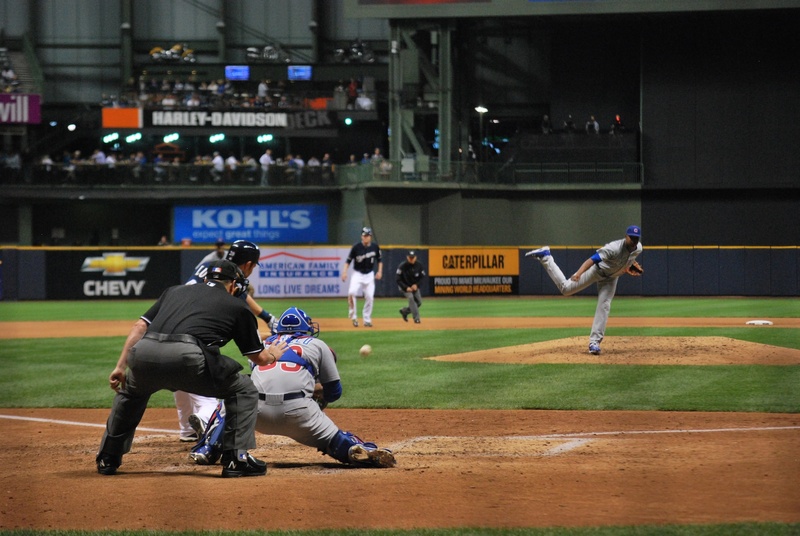 Lucroy was at the plate and quickly went down 0-2 in the count. I considered telling the lady on my left that I would take a past ball at this point. The very next pitch got past the catcher and Rickie raced home. The catcher had retrieved the ball and it’s on its way back to the plate (albeit a little late) in the picture below. 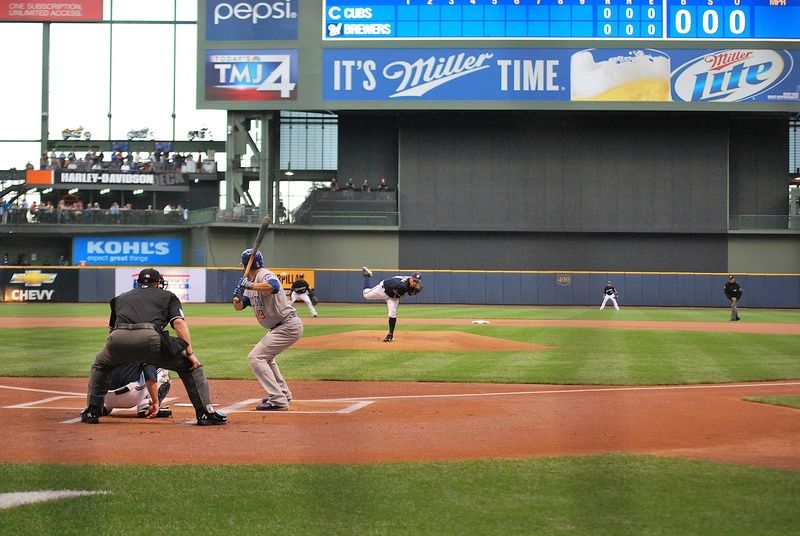 On the very next pitch Lucroy sent one to left for a two-run double and the Brewers had a 4-0 lead. In the bottom of the 8th I took a panned out picture from my seat in section 117. It’s a great seat to take in a game as long as you can block out the screen that’s right in front of your face. I know it’s a necessity and there would be concussions and knocked out teeth at every game without it, but it just takes some getting used to. 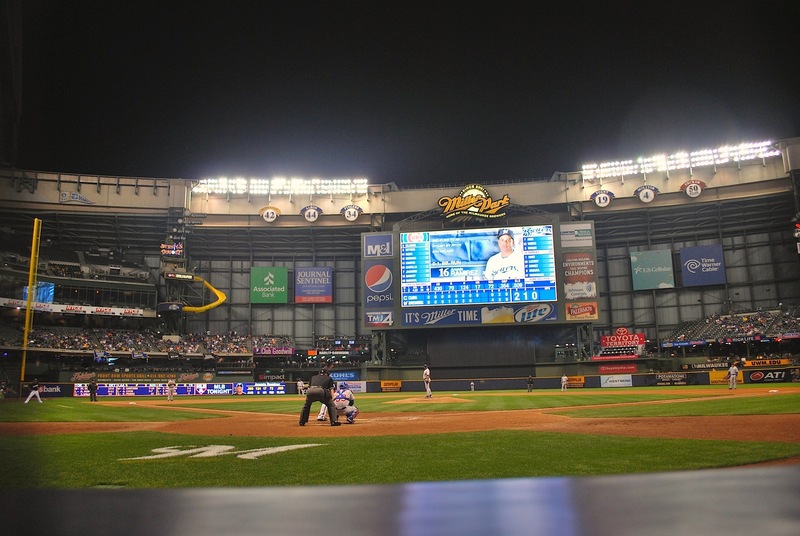 The Brewers were able to score 5 runs despite only mustering 3 hits. 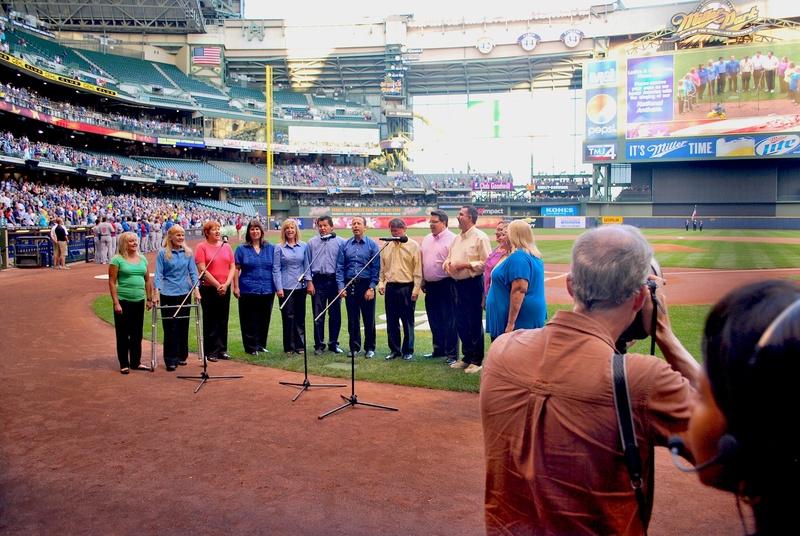 6 walks and 3 hit batsmen might be to blame… Thanks Cubs! It’s almost 1:00 AM now and the first pitch of the finale is in about 12 hours. Goodnight.